This year’s Christmas day just passed, but it doesn’t mean that we are done with providing you with deals that are too sweet to resist. The next big event that’s peeking around the corner is New Year’s Eve, which is the culmination of 2017 and the welcoming of the arrival of 2018. There are actually a lot of illustrations and animations created to symbolize the arrival of the new year by showing an old man with a cane and an infant to represent the current and the new year, respectively. Of course, it already makes a lot of sense that the new year should be greeted with a bang, and it deserves to be. Just as the new year is being illustrated as an infant, let us also think of the celebration as the birth of that infant, expressing the same emotions after waiting twelve long months for that infant to be born—which is obviously longer than the nine months from an actual human pregnancy. If that analogy is too far-fetched, then we can also think of the new year celebration as a thanksgiving, for all that has happened throughout 2017, and for a brand new year for us to redeem ourselves for failures during the previous year. 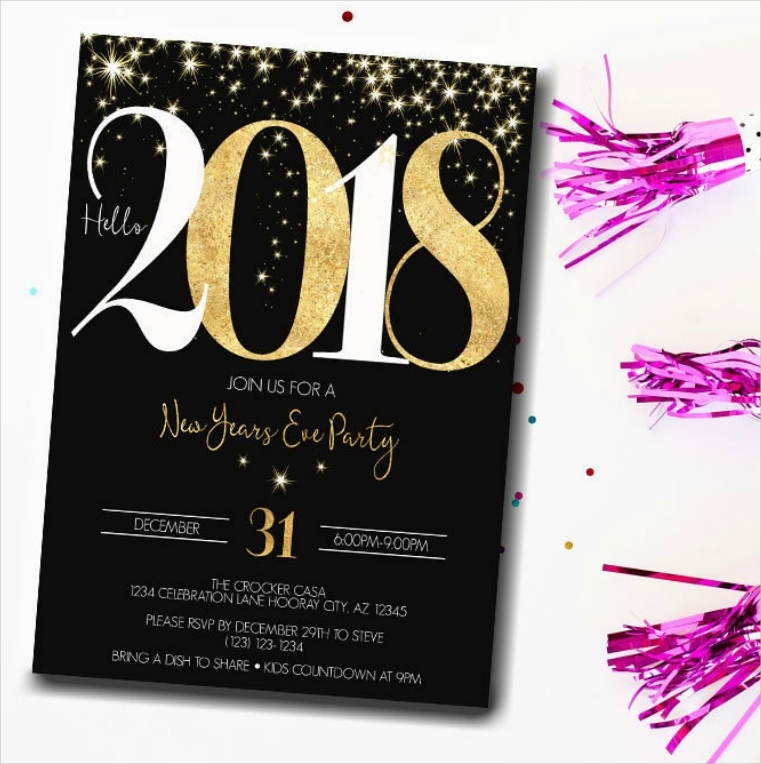 Now that we have discussed regarding why the new year deserves to be celebrated, you may also want to host or organize your very own New Year’s Eve party, and we may just have the invitation designs that you need. 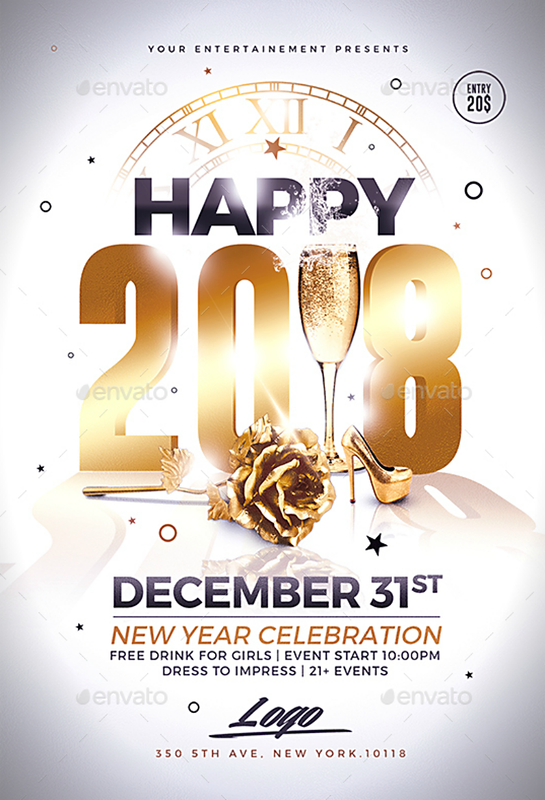 Below are fifteen of the best New Year’s Eve party or celebration designs that you can ever find on the Internet, and we gathered them up for you so you won’t have to stress yourself in going to other websites for them. 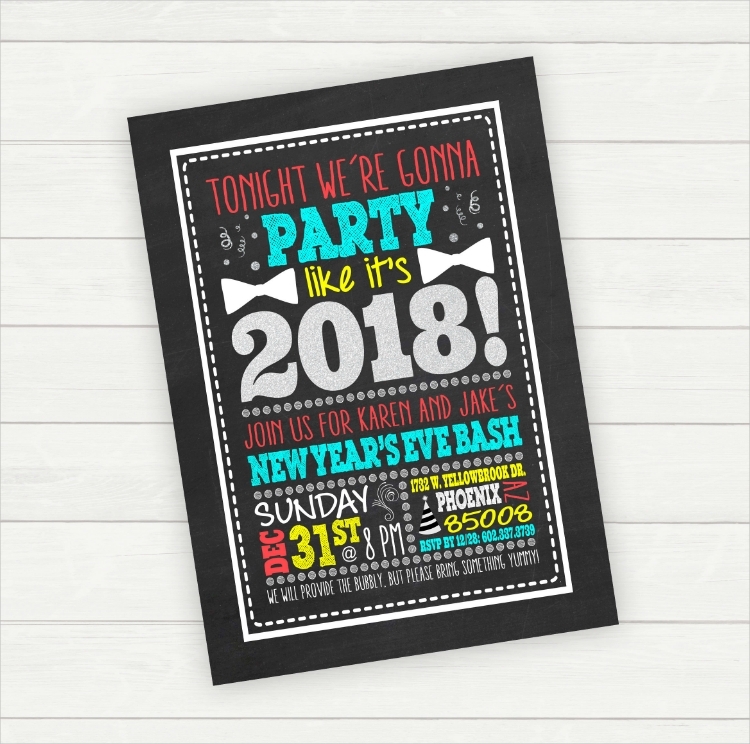 There are various party invitation designs here intended for any theme or any kind of celebration, we guarantee that you will be able to find at least one design that works perfectly for you. Go ahead, scroll down to see the designs yourself. 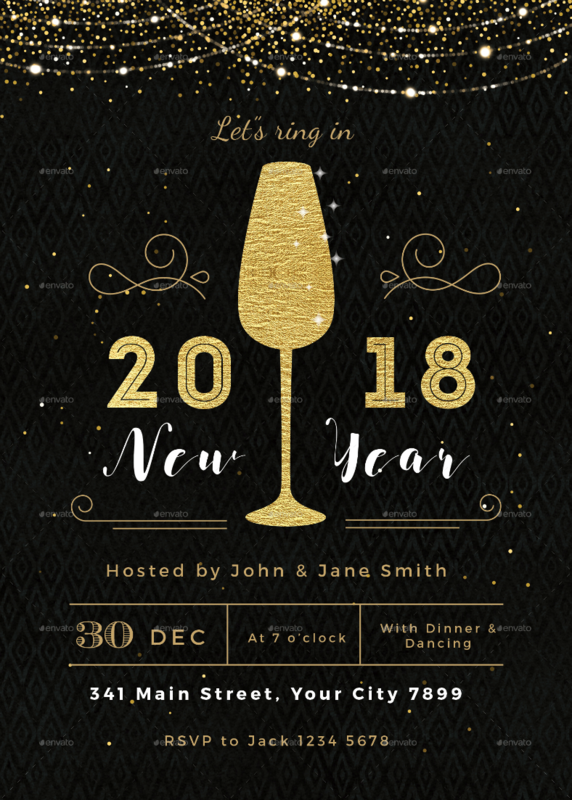 The very first New Year’s Eve invitation design on this list leans more toward simplicity and places heavy emphasis on large typography. An awesome feature that you can see from this invitation design is its use of a chalkboard theme, which is simple yet visually appealing. Even though the chalkboard invitation design is almost covered up with elements, the details can be easily read since each of them are written in different colors. And this use of different colors also helps in increasing the design’s level of appeal. “Cheers! A toast to another year!” and this gesture is commonly done during formal events. For many people, either a wine or a champagne glass is used when performing a toast and is done by raising your glass and tapping it with other people’s after a toastmaster delivers their honorable speech. For this invitation design, it shows a golden and textured silhouette of a champagne glass in the middle, which is surrounded by text indicating the details of the event. 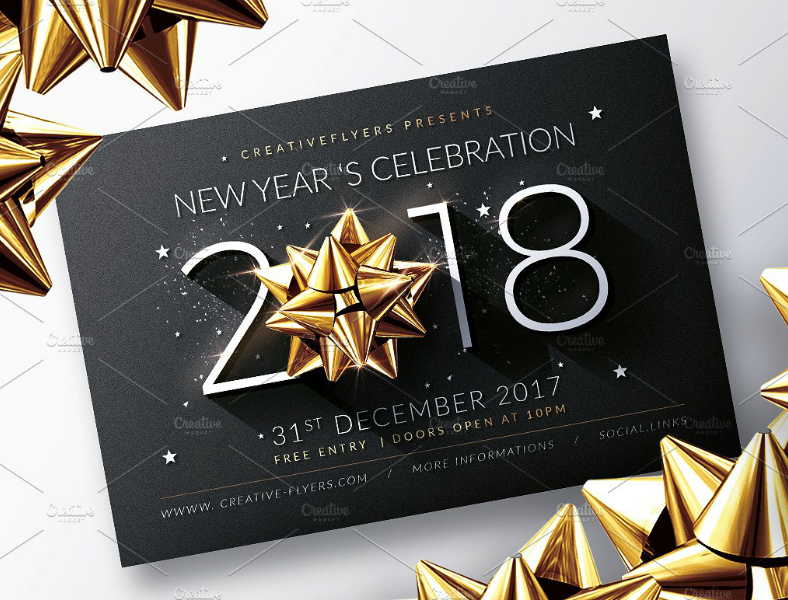 If you are looking for a clean and artistic New Year’s Eve invitation design, then the one on top may be what you are looking for. This invitation design makes use of thin lines for its elements, and the background is in a gradient color. To easily give readers the idea on what this invitation is about, the year is written in large font in the middle area of the design. This way, readers can already receive the message being conveyed without the need to include a lot of elements. 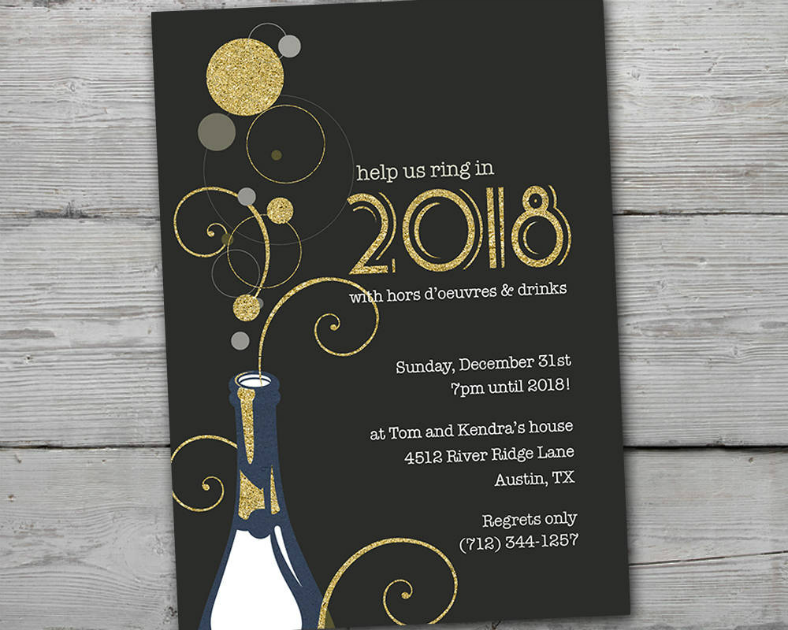 Here is another invitation design that bears an image of a champagne glass, but unlike the previous one that showed only a silhouette illustration, this one actually contains a photorealistic image of a champagne glass. In addition, this design also contains an image of a golden rose and a high-heeled shoe. If you want a creative and modern invitation design, then this may be the ideal one for you. Check out the New Year’s Eve invitation design above, it effectively balances typography with other elements. The left half of the design shows an open bottle of champagne, and the sparkles emanating from it are illustrated in a rather exaggerated but artistic manner. On the right half of the design are the text, which indicate the relevant information that a reader may need to know about the celebration. For the event invitation design above and the next one below, you may notice that both of them contain an image of a golden gift bow. When people see this bow, they often associate it with Christmas gifts, and while this bow doesn’t represent Christmas, it does represent a gift—a gift of a brand new year, specifically. Indeed, another year is another gift given to us, a gift that we can use to redeem ourselves for failures, or for us to continue with our successes. Here is the second invitation design with a golden bow that we mentioned earlier, but unlike the previous one, this design utilizes a landscape orientation. 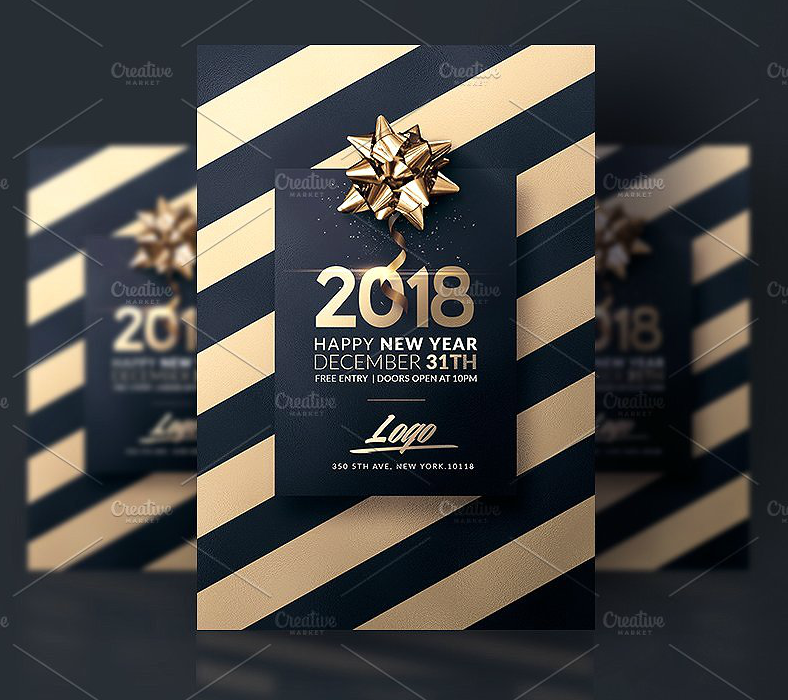 In addition, the golden bow for this invitation design replaces the zero on the text indicating the year, which is written in a large font to help emphasize it among the other elements on the design. Have this invitation design printed on either an A2 (4.25″ × 5.5″) or an A6 (4.5″ × 6.25″) card stock, place it inside an envelope of the same size, and you are good to go. Choose between two creative and visually attractive invitation designs above, one being more colorful and casual than the other that seems to lean more toward elegance. As much as it makes sense already, if your event calls for a casual theme, you may want to use the top invitation design. However, you may rather opt to go for the formal invitation design on the bottom if the theme calls for it. “Goodbye 2017 and hello 2018,” that is what we can expect from the mouths of people when the clock strikes twelve on New Year’s Eve. Many people often say that during the new year, waving goodbye to the year that just ended and saying hello to the one that just started, which makes a lot of sense. 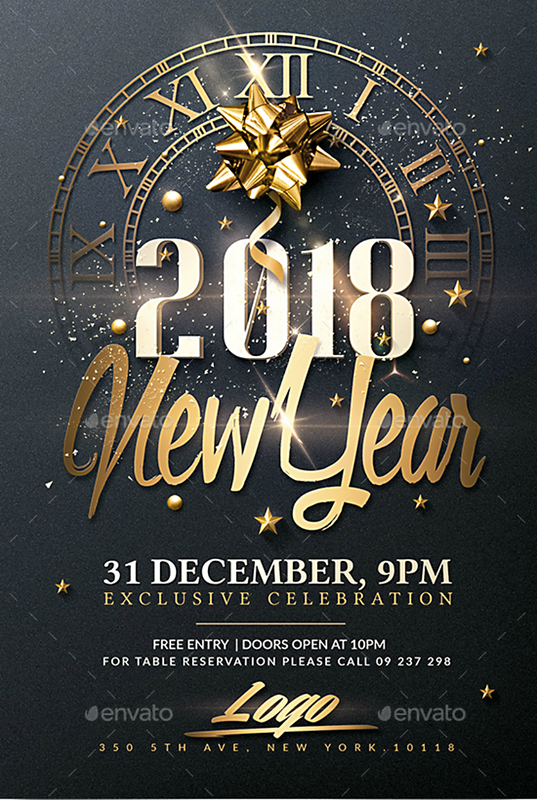 For this invitation design, the text in the middle states “Hello 2018,” with the year being heavily emphasized. Use this design for an elegant invitation with a touch of fanciness from the script typeface. 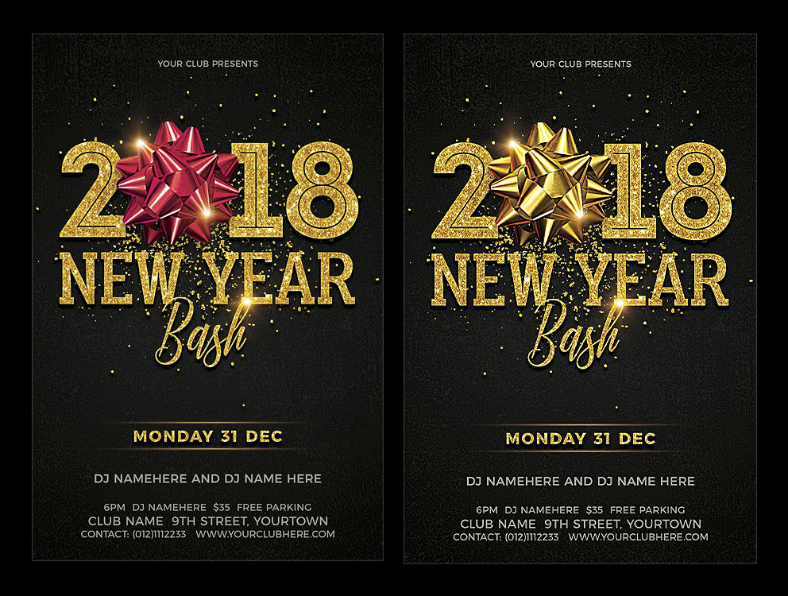 For as low as $9.00, you can get not just one, but two beautifully-created New Year’s Eve bash invitations, and you can see both designs on the sample image shown above. As you can see from the image, there aren’t a lot of differences between the two, only a change in the color of the gift bow. You can use this subtle change to make your invitation design fit the theme of your event. However, if your theme is neither gold nor red, you may still be able to use a different color for the gift bow, feel free to use any color you want. Check out this invitation design that somehow resembles a doomsday clock, which is an image of a clock with the long hand being three minutes before midnight. However, for this one, we are not talking about any doomsday or negative event since the new year calls for joy and happiness. For this design, the image of the clock shows a time that is about eight minutes before midnight—or in other words, eight minutes before the coming of the new year. Here is a simple yet effective invitation card design that compresses all content in the middle area of the card and leaves the rest of it as a striped border. Somehow, when we see stripes as such, we are often reminded of retro designs, same as the ones commonly used outside barber shops in the past. For this design, it only features a limited number of elements to help keep the invitation clean and easy to read. 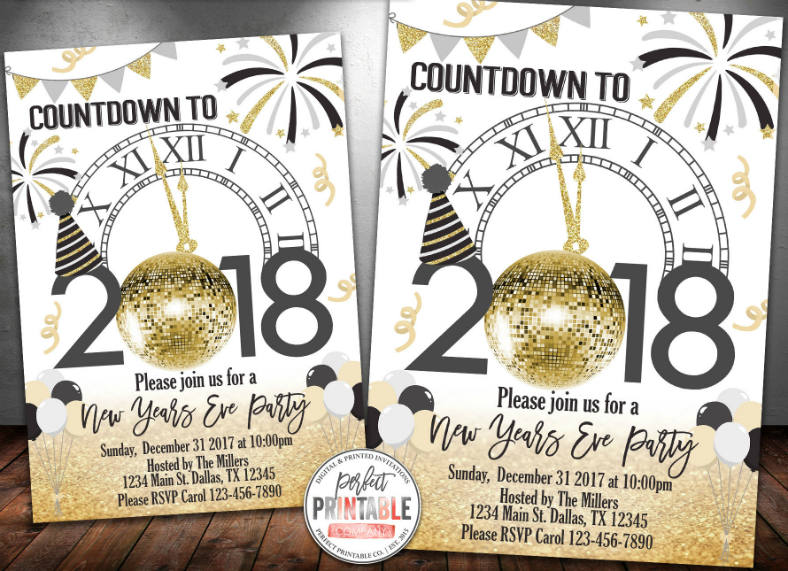 Counting down to twelve midnight is the entire theme of this New Year’s Eve party invitation design. Behind the year is an image of a clock that shows a time that’s three minutes before the arrival of the new year. On the upper portion of the design, you can see an image of some buntings and some explosions from fireworks. On the other hand, the lower portion of the design contains all the relevant details regarding the event. 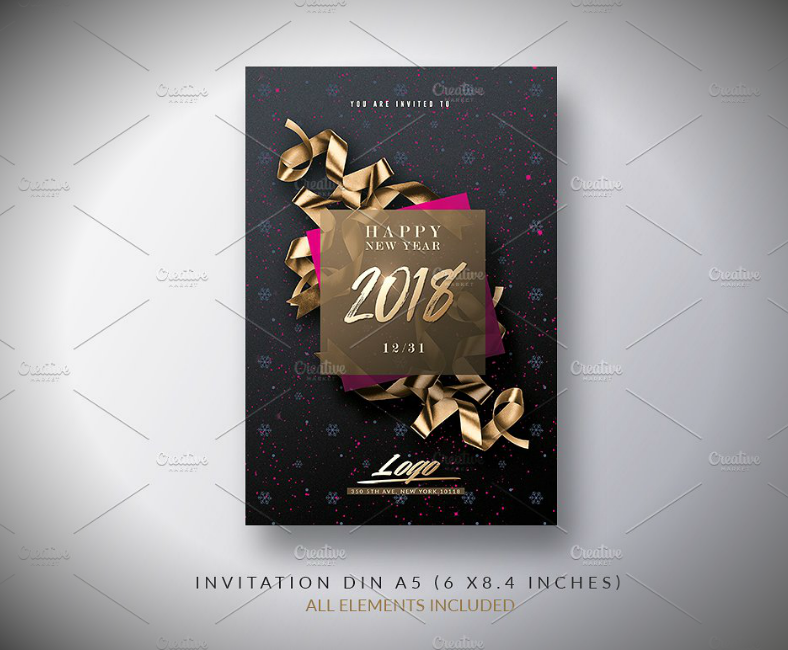 Here is a clean and layered New Year invitation design that you may be interested in. The bottom-most layer of this design—the background—features a dark background with a pattern of snowflakes. Over that layer is an image of a twirled-up golden ribbon that serves to beautify the appearance of the design. The layer on top of that shows two differently-colored squares, with the pink one slightly tilted counterclockwise. On the topmost layer of this design are the details to the event that an invitee needs to know. If this is what you need for your event, then feel free to download it. 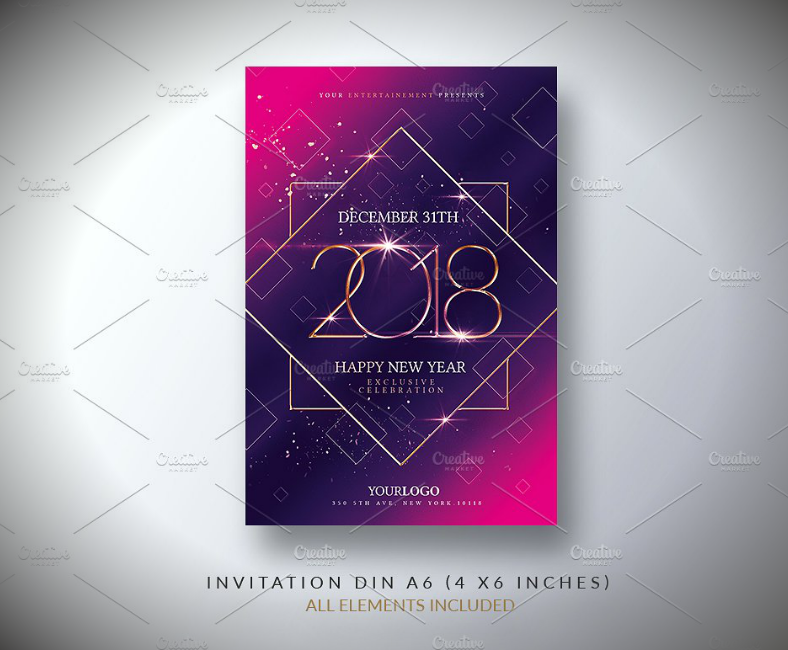 The final New Year celebration invitation design on this list heavily uses glitters and star-shaped elements around the upper and lower edges. The background of this party invitation design makes use of a blue gradient color, which is free of elements to make it easy for the invitee to read the information written on it. In addition to making this invitation design easy to read, each section of the details are written not only with different colors but also with easily distinguishable typefaces. 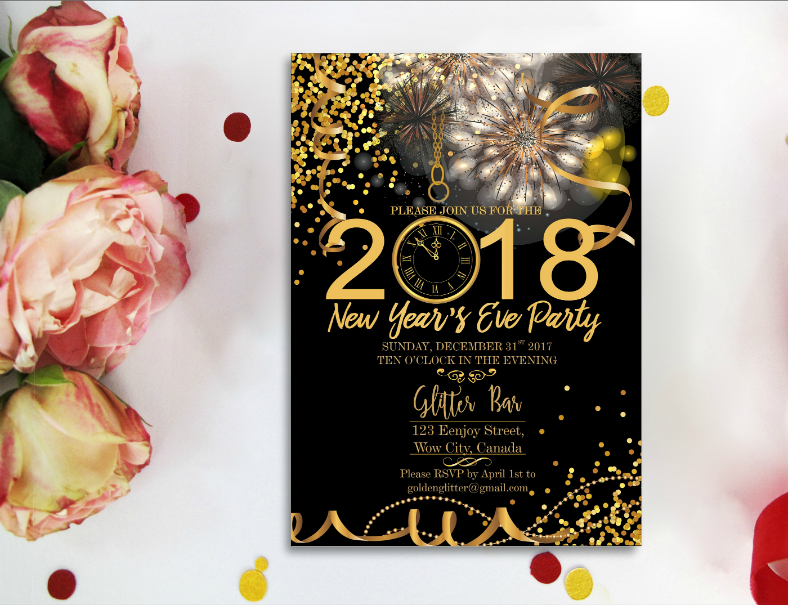 Now that you have finally reached this point of this article after going through all those impressive New Year’s Eve celebration invitation designs, we strongly assume that you were able to find at least one design that caught your interests. Whether or not that’s true, continue reading on, it is best that you know further the background behind these designs. Who knows? It may even help convince you more that the invitation designs that you are looking for are right here. One concern from many people would be the whereabouts of these invitation designs, “Where were these gathered from?” or “Who made these?” First, these invitation designs were carefully chosen from among hundreds of the best ones from various reliable sources, and these websites offer more than just designs for invitations. Second is that these designs were created by some of today’s leading graphic artists from all over the world. 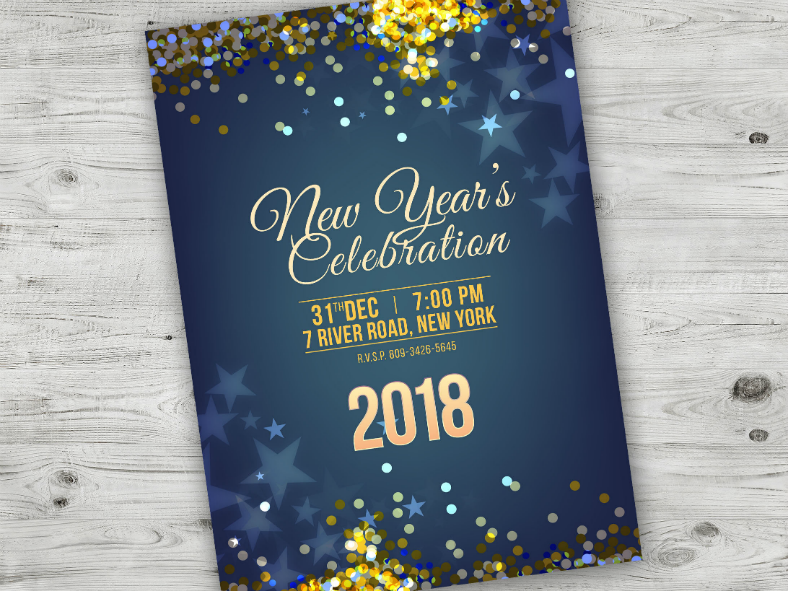 That said, you are already guaranteed with professional-grade New Year invitation designs if you download from our website. Another common concern would be to answer how easy it would be to customize these designs. Thankfully, because of the graphics format being used—which is the vector format—these designs are so easy to edit, in fact, you may even be able to individualize each element for editing only specific aspects. Another advantage that you can benefit from using vectors is the design’s ability to stay sharp and in high resolution even after being edited. 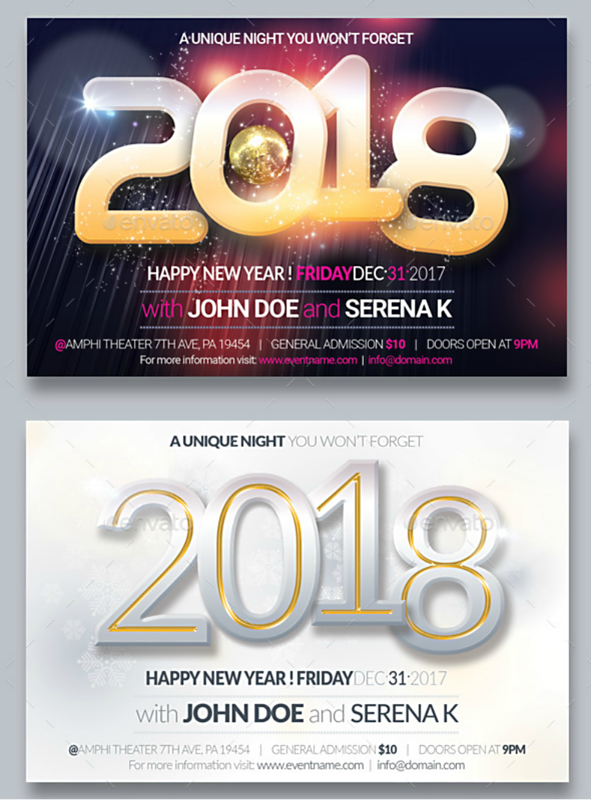 However, for those wanting to use a different format, we also have an entire collection of invitation designs in PSD for you. Finally, the last but probably not the least concern of many people would be the cost of having to download such high-quality designs, which a lot of them may think to be a lot. But the answer may surprise you, because you may be able to download these invitation designs for such a very reasonable price considering the quality that you are actually getting. High-quality invitation designs, low price, where else can you find such an awesome deal? And the answer is here, so if you are already familiar with the steps to designing a party invitation, you better start downloading a design now.